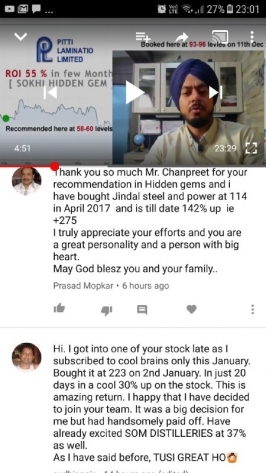 Nobody in INDIA SHOWS you his LIVE DEMAT ACCOUNT ! Ask yourself WHY ?? See my Live Demat A/c and the returns.. If you want to make MONEY ...have the RIGHT MINDSET ! Market does not care anyone’s emotions and the same is expected from a trader too. No business is run on emotions. Make yourself part of 5% Profitable Traders ! When uncertainty is more One has to be more patient to beat that. The same principle applies here too. More patience will fetch you big money. "Chanpreet sirjee, This is spectacular and this is real - what a rally! I have been sitting on SunTV waiting for this day for past many months. But the day has arrived 'again' and this time booked profits of "more than a lakh on 1 LOT of SunTV" - Finally!! Great job sirjee! You really have the patience that many lack in this Indian stock market, we need not be more convinced! Now, our slate is clean with more great trades and great days to come! Balle balle! Cheers, Shyam..Hilversum, The Netherlands"
Get Entry in to India's Largest Investing Club ! Disclaimer : www.sokhiteam.com does not take any compensation of any kind whatsoever from any company that they mention on this website. All data and reports at www.sokhiteam.com are only information services for investors and are not individualized recommendations to buy or sell securities, nor offers to buy or sell securities. The publishers of reports, reviews and analysis under www.sokhiteam.com are not acting in any way to influence the purchase or sale of securities. The information provided is obtained from sources deemed reliable but is not guaranteed as to accuracy or completeness or as to the results obtained by individuals using such information. It is possible at this or some subsequent date, the publishers of reports, reviews and analysis at www.sokhiteam.com may own, buy or sell securities presented.